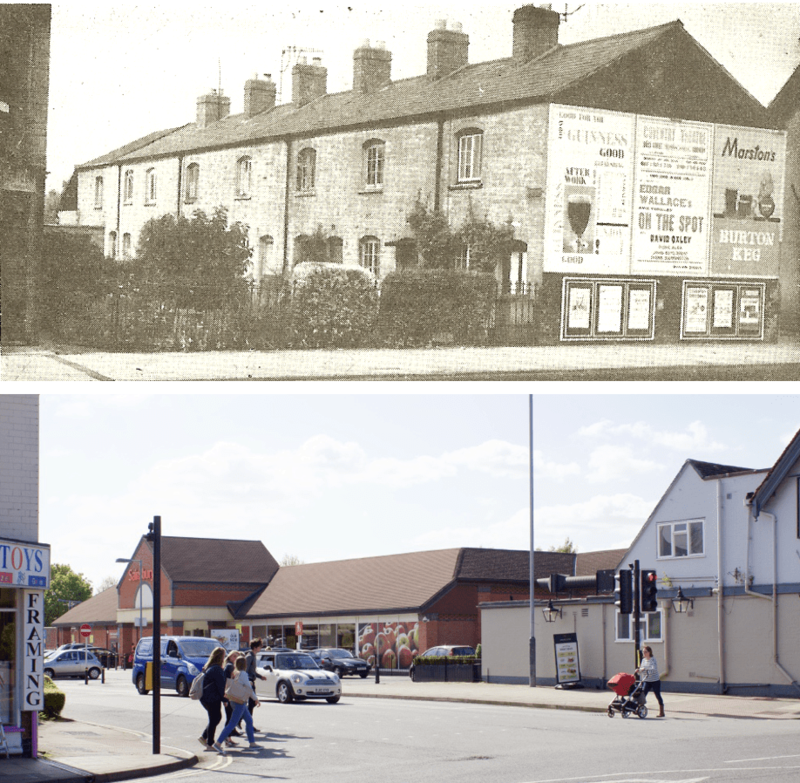 Younger readers may be unaware that a row of houses, named Fairview, once stood where the entrance of the Sainsbury’s carpark now lies. This ‘then’ photo was taken in July 1964 by John Drew for his book Kenilworth – A Manor of The King (Pleasaunce Press, 1971) shortly before the row was demolished. According to A Portrait of Kenilworth in Street Names by Robin D Leach & Geoff Hilton (Rookfield Publications, 2015) the name relates to the fact that the properties had a view of the statute fair which used to be held in the Bear Field, behind the Bear & Ragged Staff pub next door. It also records the date of demolition as late 1966. The name Fairview lived on for a time in the name of the carpark that was built on the site. The Fairview carpark was used for the market for a number of years and at the rear of the site was Guest for Plants nursery, one of the last of a number of plant nurseries which used to exist in and around the town. Ironically, in an effort to preserve the name Bear & Ragged Staff when the neighbouring pub was renamed as the Tut ‘n’ Shive, we lost the name Fairview from our town map. Brian Jackson recorded in Kenilworth History 1995 – 1996 that “Sadly, some two years ago, we lost, for a more gimmicky name, The Bear & Ragged Staff, used by the pub in Warwick Road since at least 1828. Thanks to our Chairman’s efforts, however, the name of the nearby car park has now been changed from Fairview, to the Bear and Ragged Staff Car Park”. Now that the pub name has reverted to Bear & Ragged Staff, perhaps it’s time we renamed the carpark to Fairview again? A branch of Sainsbury’s was built to the rear of the pub in 1996, occupying the site of the old Buckingham Vehicles engineering factory on Eagle Lane. During the construction several archaeological finds were discovered: “After evaluation the site was subject to salvage excavation and a limited watching brief. This recorded substantial medieval structures, mainly within the footprint of nos 60-64 Warwick Road. Substantial foundations indicated a building more than one storey high. This plot of land lies within an area where a messuage (dwelling and associated land) had stood along the frontage of Warwick Road (first recorded in 1581”). In June 2000 planning permission was granted for two dozen homes to be built on the site of the old Guest for Plants nursery at the rear of the old Fairview carpark site, now forming St Mary’s Court, accessed off Queen’s Road.